During my freshman fall at MIT, I took a seminar, called Digital & Darkroom Imaging in the Edgerton Center (aka Doc Edgerton, the guy who took this picture). We didn't get to shoot an apple and snap a photo of it, but we did get to use MIT's strobe lab and get photos of the crown of a milk drop and a balloon popping. The final project for the class was more or less whatever we wanted it to be. 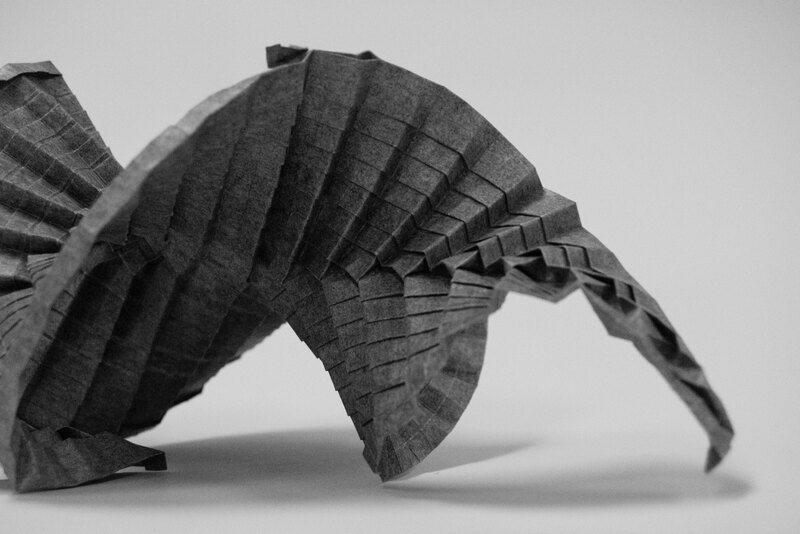 I had always wanted an excuse to photograph some of my origami very nicely, but had never had the resources, time, or access to a nice, large format printer. This was a good excuse. 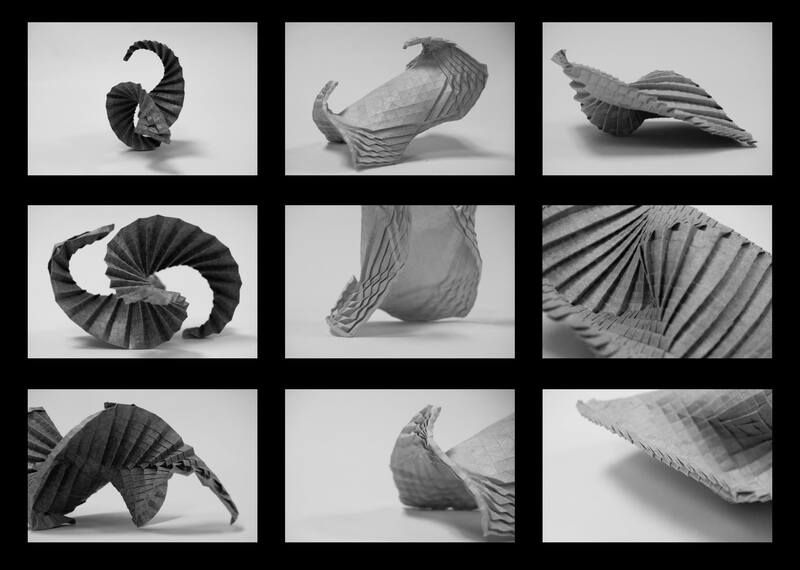 Each model is my own design, each an experiment in organic origami using only pleats. 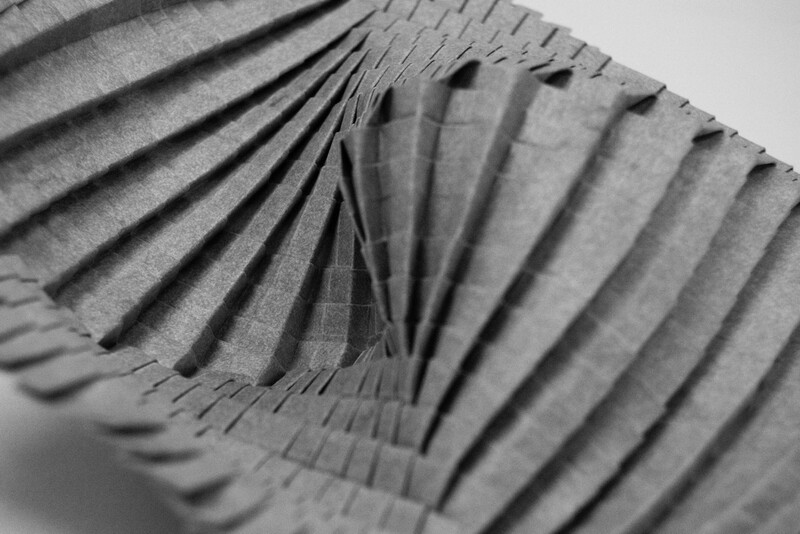 That is, each model consists only of folds in alternating directions, staggered across the paper, intersecting at (usually) right angles. If paper were ideal, the resulting models would be exceedingly boring, just flat pieces of paper with many grid lines. 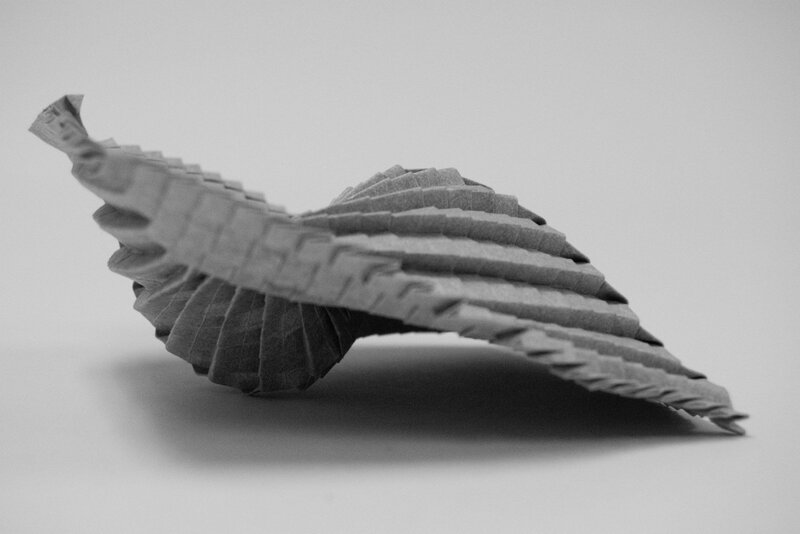 This methodology of pleating exploits paper's natural material properties (e.g. thickness). 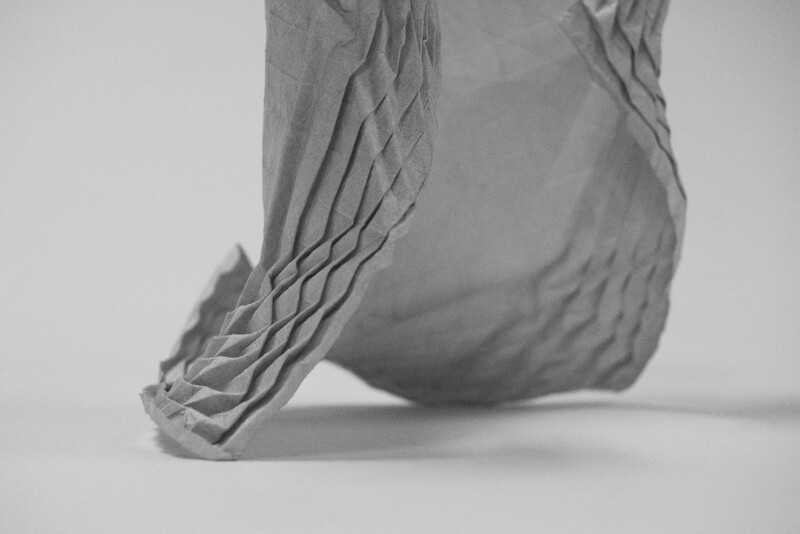 Due to continuous and iterative pleating, a great deal of paper builds up over the same location in the finished model, applying internal forces and forcing the paper to find an equilibrium that is most often unexpected and usually quite nice looking. Perhaps the most interesting part of these models is the overwhelming organic quality of the piece despite consisting only of mechanical, geometric folds. 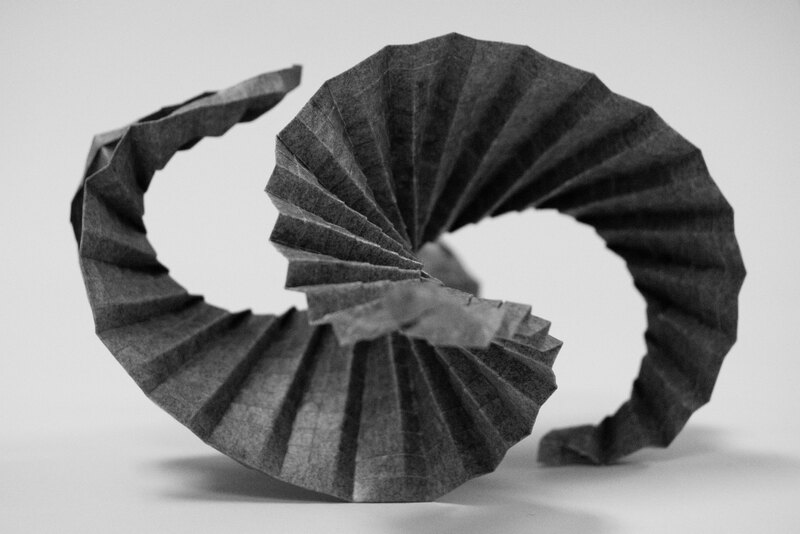 Each model was folded from a single sheet of Elephant Hide paper, each around 40 to 50 cm in diameter. The left and rightmost models above were folded from a square, the middle one was an experiment using an octagonal sheet of paper. 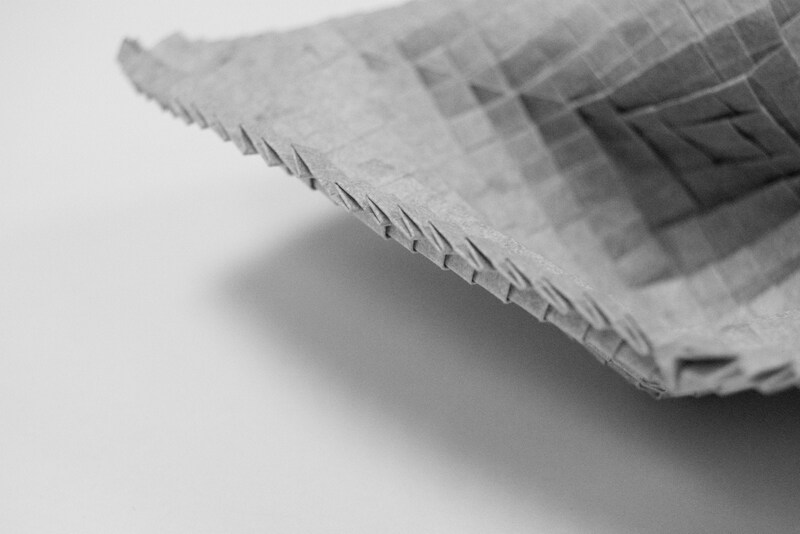 Each model began by hand folding at least a 64x64 grid, then collapsing the model along the folds. It's interesting to note that the model on the left and right share ostensibly an identical crease pattern - the only difference is the order in which the grid lines were folded. The left and right models get their unique structure from their anti-symmetry across the center diagonal; each half has an identical folding structure, however in the opposite direction. The octagonal model and the spiraly one on the left both explore a specific facet of pleated origami, what I'll call pleat expansion. After folding every internal pleat for the entire model, the pleats are forced open at the edges and locked that way. 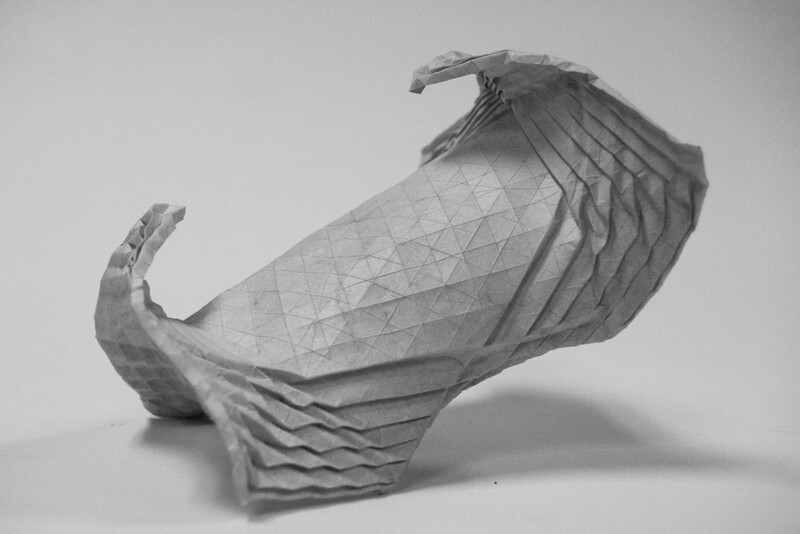 This causes the paper to contort dramatically, and is the source of the leftmost piece's surprising symmetry. 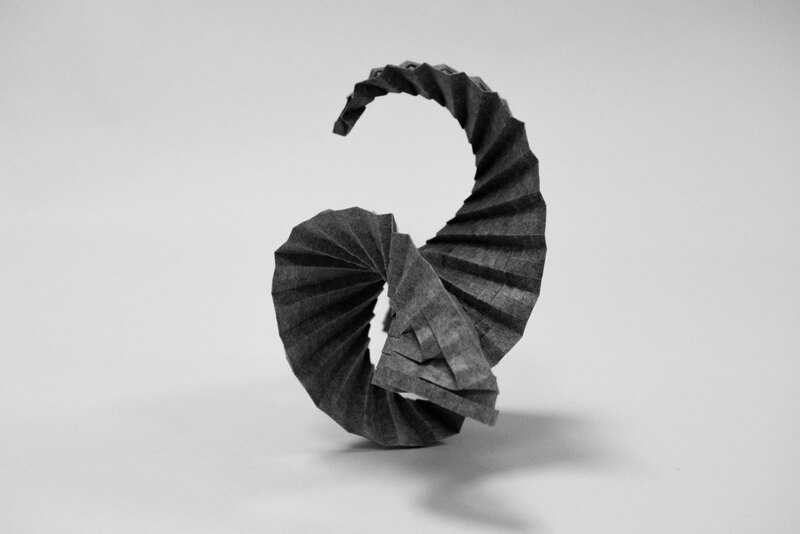 It's difficult to photograph origami and make it seem very interesting; the models themselves are not massively large, perhaps only a maximum of eight inches diameter in any given direction. With each photograph, I tried to make the piece seem larger than it is; I've always considered this kind of abstract origami to be some kind of "sculpture", but it's always been difficult to convey the pieces via photo in a way that seems fitting. I spent some time debating whether the final composition should be in color or grayscale. Black and white seemed like the certain choice however. Besides the fact that each model has a different color, I thought that color would detract from the focal point of the images, that is, the form and structure of the models themselves. 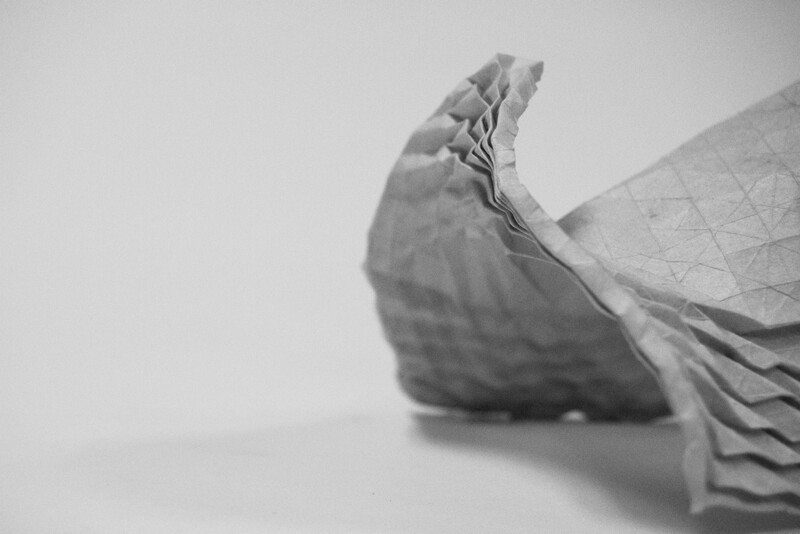 Grayscale makes the contrast apparent, causing the shadows the paper casts to become meaningful parts of the image. Each photo was taken with the entire composition in mind; the 3x3 structure of the three triptychs was intended from the beginning. Each row corresponds to a unique perspective, each trying to capture a different detail of each respective model. Each of the nine photographs are large 11x17" prints, meant to be displayed as in the header image above. By no means do I consider myself a great photographer, though I'm pretty happy with the results.